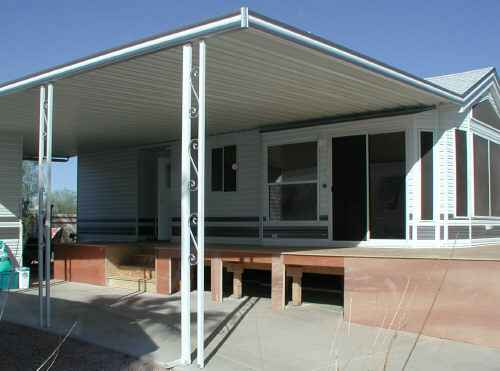 Aluminum awnings and carport covers offer an affordable option for shade and rain protection. Aluminum awnings can be used for patio covers, carport covers, screen rooms roofs or to protect just about anything of value. Aluminum products enhance the beauty of your home and protect your property. A solid roof is the best choice for providing you and your outdoor furniture with maximum protection against the elements. Your car, RV or boat can all be protected from the harsh elements with the strength and durability of aluminum. Whether it's attached or a freestanding design you will have reliable protection for years to come. Beautify your home while protecting your drapes, carpet and furniture from sun fade with an aluminum awning. And don't forget the energy savings from all that extra shade. Standard aluminum awnings start at about $6.00 per square foot. Extras can add up fast with addition of I-beams, steel posts and heavy gauge panels. About the most you should expect to pay is $9.00 per square foot. For an exact awning price we give free estimates at online quotes where it's as easy as filling out a short form. We can provide estimates for awnings, alumawood, window awnings, sheds, decks, room additions and so much more. I strongly recommend these folks to professionally package and ship your Aluminum Awning Kit. These pages contain prices for awning components and other mobile home products. We would be happy to install any of these products for you.